The two memory chip makers are as different as it gets, so which looks like the better stock to buy today? Though they share the same market, Samsung (NASDAQOTH:SSNLF) and Micron Technology (NASDAQ:MU) have little else in common. In addition to the memory chip market, in which they compete head-to-head, Korean electronics powerhouse Samsung also touches virtually every corner of the consumer electronics market. At the other end of the spectrum, Micron Technology manufactures and sells memory chips and nothing else. Concentration has made Micron a classic boom-and-bust stock, while Samsung's diversification and size provide investors shelter in times of falling chip prices. But Samsung lacks Micron's upside potential when things are flush. Given their apples-to-oranges nature, let's compare Samsung and Micron across a few important investment criteria to see which represents the better buy today. As longtime followers of Micron will attest, the market for memory chips, particularly the commoditized DRAM market, is fertile ground for boom-and-bust cycles. In this area, having the financial flexibility to withstand an unexpected swing in memory chip prices is critically important. Here's how Samsung and Micron compare in terms of their liquidity and leverage measures. Samsung data is in U.S. dollars. 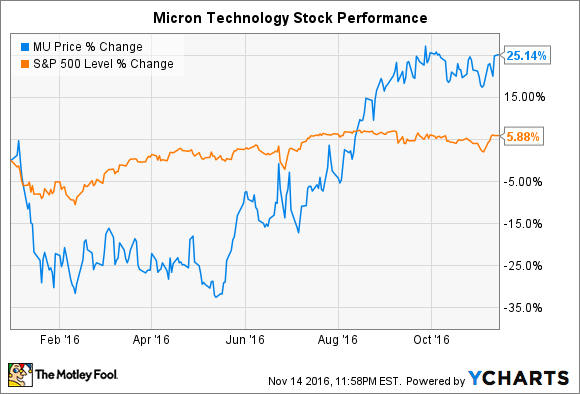 Data sources: Samsung, Micron Technologies, and Yahoo! Finance. Though Micron doesn't necessarily look to be in terrible near-term shape, Samsung stands head and shoulders above its memory chip rival in terms of its financial flexibility. To be fair, though, that shouldn't come as a surprise. Samsung manufactures and sells a dizzying array of products, ranging from smartphones to oven range hoods. This gives Samsung tremendous economies of scale versus the diminutive Micron. At the same time, Micron's ability to finance its operations doesn't look especially precarious as we see from its quick ratio of nearly 2. Micron's overall debt burden, though, does appear alarmingly high. In fact, Micron flags that "debt obligations could adversely affect our financial condition" as a risk factor in its SEC filings. Even if Micron appears to be using its leverage for productive purposes, there's little doubt that Samsung easily wins the financial comparison between the two by a landslide. With roughly 60% of its sales coming from dynamic random-access memory chips, or DRAM, Micron's financial performance tends to ebb and flow with the condition of the broader memory market. Especially given the products' commoditized nature, it shouldn't come as an overwhelming surprise that Micron more or less lacks a meaningful economic moat. Micron's share-price performance in 2016 speaks to this dynamic. You'll notice that the first half of 2016 looked fairly bleak for Micron. Its stock traded down sharply as DRAM prices softened, prompting media outlets to warn that matters will only grow worse. However, owing to a number of factors, DRAM prices didn't crater as many expected, which helped trigger Micron stock's impressive rally in the second half. The point here, though, is that Micron largely succeeds or fails based on the whims of the market in which it operates. The same cannot be said for Samsung, whose product diversification has a protective effect, as was already mentioned earlier in this article. At the end of the day, there's simply no comparison between the staying power of these two companies. If this were a boxing match, Samsung takes this round in a first-round TKO. Again, the differences in quality manifest themselves when the companies' valuations are compared. Here's how Micron and Samsung stack up across several of the most commonly used valuation metrics. EV = Enterprise value. EBITDA = Earnings before interest, taxes, depreciation, and amortization. Data source: Yahoo! Finance, except for forward P/E ratios, which are retrieved from Morningstar. After losing money in 2015, Micron remains unprofitable on a trailing-12-months basis, which explains its negative current P/E ratio. It's worth noting that Samsung's bottom-barrel valuation likely isn't the result of an oversight by Mr. Market. Though it often trades at something of a discount to the broader market, Samsung's valuation likely speaks to the expected negative impact the Galaxy Note 7 recall will have on Samsung's bottom line. The company recently revised down its guidance and informed investors that the mass recall should cost it over $3 billion in the next two quarters. However, this negative story line will eventually fade into memory. When it does, things will be back to business as usual for Samsung, whereas it remains anyone's guess where Micron will end up in the coming quarters. Looking at each company's valuation through the context of its longer-term business prospects, Samsung also enjoys the more compelling valuation today. Sweeping all three categories, Samsung clearly stands as the more sustainable stock pick for investors looking to buy and hold for the long term. To be clear, this doesn't mean that Micron cannot succeed. In fact, a sustained period of strong DRAM prices could send Micron shares to the Moon. However, it's anyone's guess whether that will happen. All things considered, Samsung is the higher-quality company and the better buy today between these two memory chip rivals.